Wondering what all those police sirens were for last night? The Victoria Police Department knows, and thanks to their outstanding social media efforts, you can know too. One of the most consistent items of feedback the VicPD receives is that they need to communicate more. Note taken—what started off as a online method of communication during the Olympic torch run is now a social media information-fest spread over Facebook, Twitter and a surprisingly well-written Operations Blog. VicPD noticed how internet users are now seeking information from less-traditional sources, and in response, they created a way to offer the public different and better insight into what the police service actually does. It’s a way to communicate and send information to the public, and it helps people better understand what’s going on in their communities. I don’t know a single person who doesn’t gawk at sirens/flashing lights, so VicPD’s social media insights are gobbled right up. VicPD’s Facebook and Twitter accounts contain links to the blog, as well day-to-day police activities (ie lunch at Boston Pizza to support Baby Molly) and links to other news and articles. 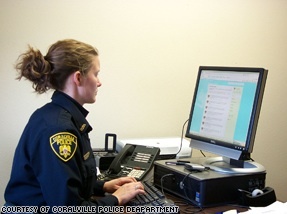 The department also uses social media to assist in criminal investigations and missing persons cases. Last April, they used social media to find a missing child. They released info over mainstream media, but they also tweeted that the child was missing. After many RT’s, the child was found by municipal employees who had been tweeted. Unless you live in a small town, it’s impossible to know what’s going on in the police world. But thanks to VicPD’s social media efforts, Victoria’s lesser-known (and really strange) news is just a click a way.